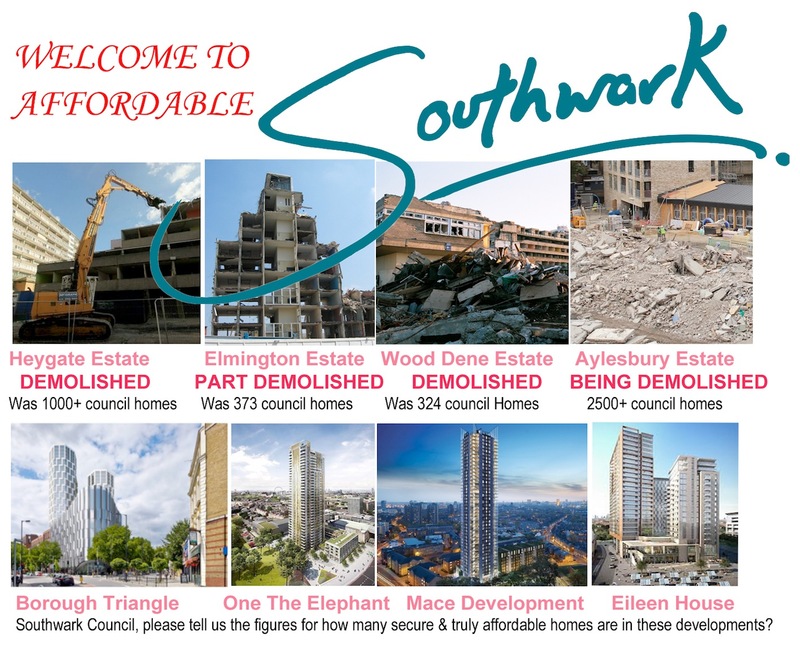 Southwark housing campaigns and activists support the occupation on the Aylesbury Estate | Southwark Notes - whose regeneration? Numerous Southwark housing campaigns and other local activists warmly welcome the ongoing occupation of a number of empty homes on the Aylesbury Estate. 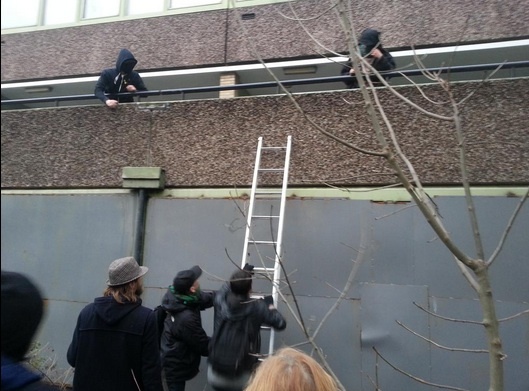 The current occupation of Chartridge block on the Aylesbury Estate has brought a much-needed spark of inspiration to local residents and housing campaigners. Southwark Labour council has been publicly claiming how the Aylesbury was not going to be another Heygate, as ‘lessons have been learned‘. The Heygate Estate decant programme has been widely denounced as an exercise in both the undignified displacement of locals and initiating the gentrification of the Elephant & Castle. However, exactly like on the Heygate, Southwark has been displacing the Aylesbury residents out of their immediate area and subjecting leaseholders, many of them elderly people who’d lived in the area their whole lives, to unnecessarily brutal Compulsory Purchase Orders. Abysmally low offers for their homes are forcing them to leave their neighbourhood and communities for good. The right of tenants to return to a ‘regenerated‘ Aylesbury would force them to take non-council tenancies in more expensive Housing Association flats, something many residents do not want. In 2001 a majority of Aylesbury residents voted ‘No’ in ballot on the Councils desire to transfer the estate out of council ownership. Not only is this ballot no longer being honoured, the Council has been unwilling to undertake a new ballot of residents on the question of refurbishment instead of a total demolition. The Council attempts to dismiss the occupiers as ‘not representative‘ of the Aylesbury residents while claiming Southwark is building ‘more affordable homes than any other London borough‘. Council-backed developments such as the One The Elephant tower contain zero (0) ‘affordable‘ homes, let alone any social-rented ones. Local people know that council-rented homes are the most affordable and secure. Promises by the Council to build 11,000 new council homes in the next 30 years have been met with hesitant support, with no guarantees that this will not simply involve demolitions of estates without residents being balloted. In a borough that has some 18,000 people on the waiting list for council (and not housing association, nor ‘affordable‘) homes, none of the above can be tolerated any longer. Since they reclaimed the homes on the Chartridge block, the Aylesbury occupiers have been holding public meetings every day at 6.30pm, and each meeting has been packed with neighbours from the estate itself, other Southwark residents and campaigners from across London. The occupation clearly highlights the disasters of Southwark’s own and London housing and development policies in which profit gained from land speculation comes way before the people whose homes and lives are destroyed in the process. ‘Ordinary’ Londoners, be they the Aylesbury occupiers, FocusE15 mothers or the New Era Estate residents, are showing that alternatives exist and they work. Add your name: If you, as a Southwark resident, or a local community group or just a supporter from anywhere, would like to add your name to the list of supporters, please email here as soon as you can – if you are a resident, all you need to do is say is your first name and area you live in, eg John, Camberwell. This entry was posted in Uncategorized and tagged Aylesbury Estate, Gentrification, occupation, Southwark, statement. Bookmark the permalink.